This fast paced two day workshop is a great opportunity for anyone who is looking to learn more about managing revenue in a hotel or any accommodation business. The course is for people who would like to move into a Revenue Management role, those with less than 3 years experience AND for those who need to manage a Revenue function. If you’re looking for a formal Certificate from a 90-year old global hotel association, the HSMAI Certificate in Revenue Management (Hospitality) delivers that at a fraction of the price of the only other globally recognised program (Cornell). 1. BEFORE THE WORKSHOP: Once you have registered, within a few days your log-in details will be sent to you for the course from ecoach.com. 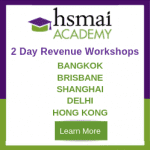 If you have not received the details a week after registration, email us at info@hsmai-asia.org to advise us. NOTE: Please ensure that you check your junk folder before emailing us. 2. AT THE WORKSHOP: You will need to bring your laptop/tablet to use throughout the workshop. Please login to ecoach.com with your login credentials prior to the workshop, to ensure that there are no issues logging in on the day. Do you need to book accommodation in Singapore? Our venue partner Ramada by Wyndham Singapore At Zhongshan Park is offering a special rate for those who attend the HSMAI 2-day workshop. HOW TO BOOK: Send an email to reservations requesting this rate and enter the below subject line. *Rooms are subject to availability at point of request of reservation – we recommend delegates to reserve early to avoid disappointment.